There's actually a WIP in the house! Oh frabjous day! When it's cold and snowing outside, it feels great to sit down and accomplish something. I'm just doing a simple quilting echo of the coloured strips. I can see some pulling on the white bits, but once it's washed and used, no one but me will notice. I'm not finished yet, but have no urge to rush just to get it done. It will be done this week and the baby is due next week. All I have to do is mail it and send it off to England. Do you think it'll get there in time?! I made a run down to St Albans, Vermont yesterday for quilt batting and thread, and found this adorable store brand print that I had to have for the backing. The baby's mother to be is crazy about foxes and her mother is a collector of owl figurines. It was kismet. I've linked to The Needle and Thread Network today, so take a look at the other lovely works on the go. I really like how you've off-centred the square. It makes the design very personal. Great backing fabric too! 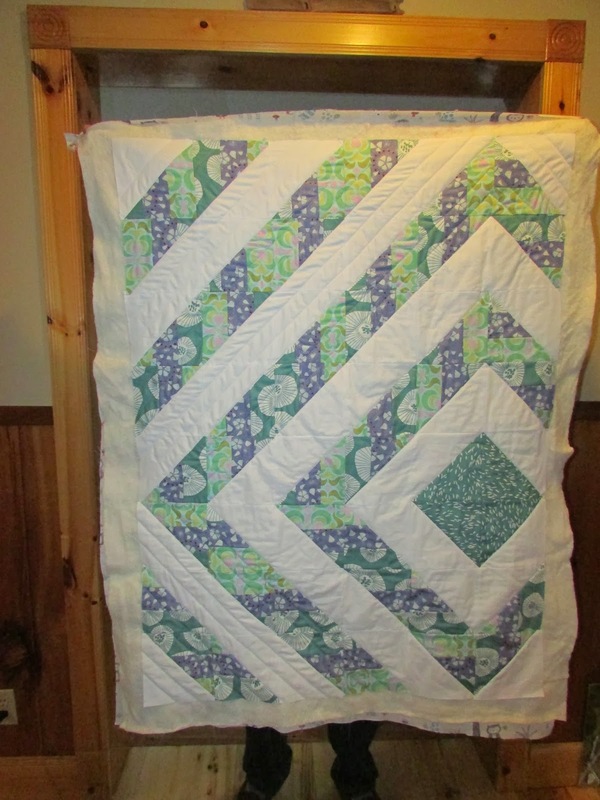 With great colours on the front, and kismet fabric on the back, you can't go wrong :) I'm sure this quilt will be well loved. Thanks for joining in with the Slow Bloggers Linky Party. Love your baby quilt! The backing is just fabulous, what a find! Oh, and congratulations on finding your jewellery, the strange workings of the mind never cease to amaze! Great design -- I do love an asymmetrical look! The backing is adorable - great find! Love the baby quilt. That asymmetrical placement of the blocks is gorgeous!